There are many websites with electric generators mounted on stationary cycles. So here is one more with a generator mounted on a Spinner Training Cycle. This one interfaces to a laptop computer that computes, records and displays the power generated, calories burned, heart rate and exercise duration each time you workout. 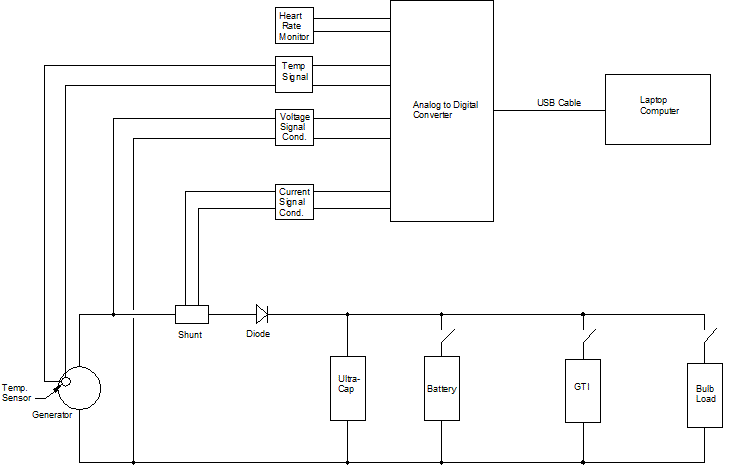 The voltage and current from the generator are measured by an analog to digital converter and interfaced to a laptop. A laptop program displays the values of the voltage and current and computes the power and calories and displays them on the screen. Measuring the voltage is straight forward, but the current is a little more involved. A current shunt is used in series with the generator and a load. All the current from the generator flows through the shunt. A current monitor IC chip measures the voltage drop across this shunt. With the resistance of the current shunt known and the voltage across it measured, the current is computed (I = V/R). A heart rate monitor measures and records the heart rate. In order to monitor my conditioning progress, I will have a record of the date and time of exercise, the number calories burned, heart rate, watt-hours (energy) generated, and length of time exercised . Oh yes, the generator bearing had been getting hot so an AD590 temperature sensor was mounted right by the bearing. This temperature is also recorded to keep an eye on bearing wear. That's me working out burning calories and watching them melt away on the laptop monitor. Close-up view of the generator mounting brackets with elastic cord pressing generator to the flywheel. Closer view of the generator and the mount bracket. Note the generator mounted on a door hinge which is fastened to one of the bracket plates. Closer view of the generator drive roller on the flywheel. Close-up of the current shunt and the current monitor IC board. Generator current is applied by the red cable to the left side of the shunt and continues to a diode from the right side of the shunt. Notice the coax cable inner conductor is attached to the left side of the shunt and the ground shield is attached to the right side of the shunt. This coaxial cable connects the small voltage drop across the shunt to the sense circuitry of the IC current monitor. The output of the IC monitor is an amplified voltage that represents the current across the shunt and is connected to an analog to digital converter. 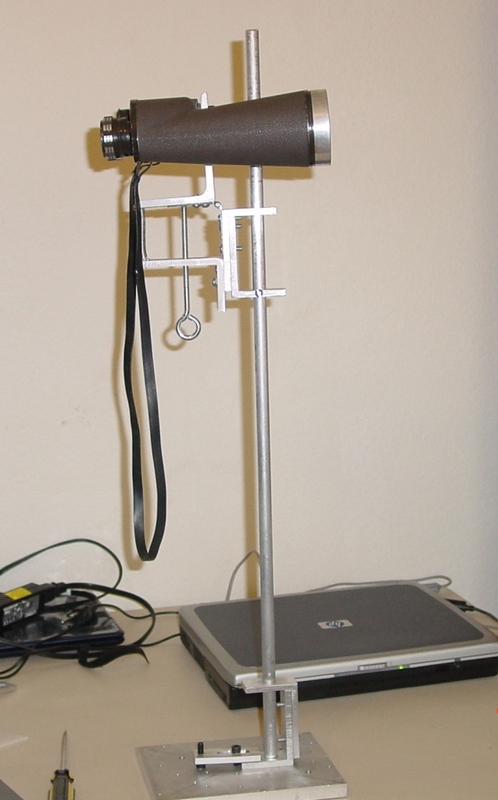 This is the image displayed on the laptop showing three analog meters. These meters display the voltage, current and power values. Calories burned are displayed at the lower left section of the GUI. Heart rate and watt-hours are also displayed. Voltage and current are sampled at 10 times per second. The purpose for such a high sampling rate will be explained later. Double click on image to enlarge. The generator located on the left is the source whose power passes thru the current shunt and the diode. Both the Ultra-Cap and the battery serve as temporary electrical storage and the Grid Tied Inverter (GTI) and the bulb load serve as the loads that absorb the power. Both the mechanical flywheel and the ultra-capacitor (that serves as an electrical flywheel) serve to smooth out the stationary cycle pedaling. This of course makes pedaling easier and more pleasurable than the jerky motion experienced when the motor is connected directly to the pedals. So the battery and/or the GTI serve as an effective storage medium. The bulb load is only used as a means to dissipate excessive power. Instrumentation: The generator is instrumented with a temperature sensor AD590 to monitor the bearing temperature. The next item instrumented is the voltage produced by the generator. This and the temperature sensor voltages are applied to the analog to digital converter. The shunt is instrumented to measure the current flowing from the generator. Finally a heart rate monitor is also instrumented to the laptop. The energy from the GTI is transmitted through the watt-hour meter in reverse direction and onto the grid. Energy not going out to the grid is used up locally at home by the household appliances. The average energy I generate is 65 watt hours, with a peak production of 70 watt hours. 1. the energy burned external to the body while pedaling the generator. 2. the energy burned by bodily functions. Plus the body has an efficiency ratio due to physical condition. That is, if your are out of shape the body is less efficient and will burn more calories to produce 100 watt-hours of external energy. Where as if one is in great shape the body is more efficient, thereby the body will burn less calories to produce the same 100 watt-hours of external energy. It turns out my body efficiency is about 10%. Based on my Polar heart rate monitor and the energy produced by the electric generator; when the energy produced externally is about 50 calories (really kilo calories) my internal body energy consumed is 500 calories. In other words it takes my body 500 calories to produce 50 calories of external work. The different methods used to measure the amount of calories burned by the body will be discussed at a later time. For now the only thing we can be accurately and consistently measured is the energy produced external to the body. The voltage and current produced by the generator are measured using an analog to digital converter. A Fluke 187 multi-meter is used to calibrated the analog to digital converter. To verify measurements accuracy, the analog to digital converter's measured voltage and current values were compared against the Fluke 187 meter's readings. As you know, voltage times current yields power in watts. One watt of power is one Joule per second. One watt per second is one watt second amount of energy or one Joule of energy. One watt hour = 3600 Joules. The program takes a power measurement each second, it then converts power in Watts to energy in Joules, then converts Joules to calories and accumulates total calories. One calorie = 4.187 Joules or one Joule = 0.239 calories. An article in Home Power magazine points out the causes of solar panel degradation. 1. Equipment security. Solar cell systems are expensive. Who will protect them from theft while you are on vacation or away from home? 3. 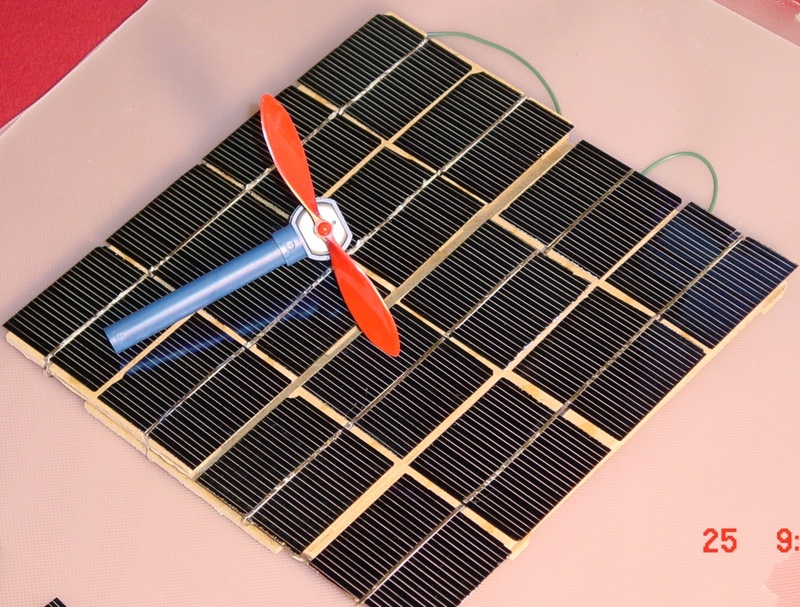 The light transmission property of solar panel plastic is degraded by solar UV. By placing solar panels in a protective location allows the elimination of this protective plastic encasement. 4. Cooler operating temperatures. Heat affects the efficiency of a solar cell's electrical production . Placing solar cells underground and heat sinking them to the ground can reduce the heat that affects their performance. 5. Lower maintenance. Having a solar cell array underground oriented down instead of up reduces dust and other debris collecting on them. Having solar cell panels out of the elements in a protective enclosure makes it easier to work on them or to modify them. So, how do solar cells work underground? Many ways, one example is shown below. The diagram below shows another version of collecting solar energy, collimating it and sending it underground for further processing. 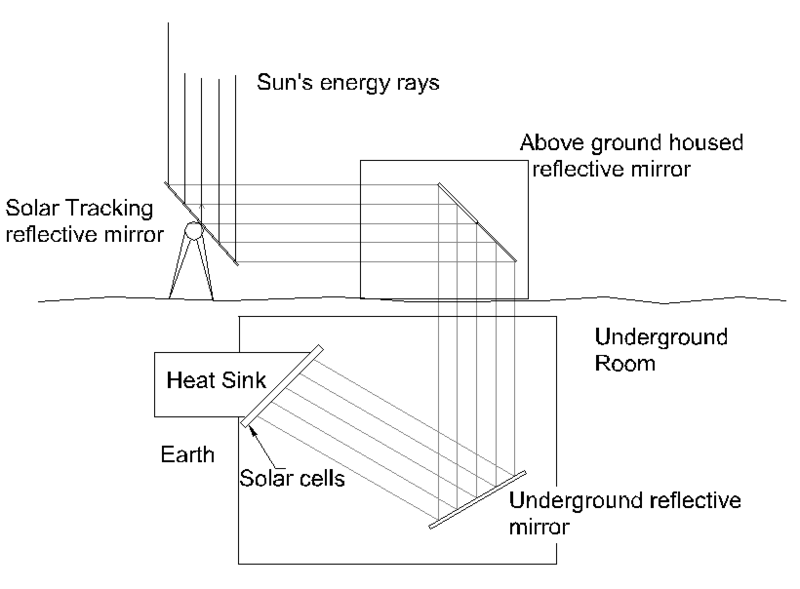 This diagram depicts an above ground housed parabolic concentrator that focuses sunlight into a second much smaller parabola whose function is to collimate this energy to a 4 inch diameter concentrated beam. The sun's angular diameter is about 0.5 degrees. It does not appear as a point source. Therefore, parabolic concentrators only focus the image of the sun and not to a point. In other words; the sun's energy can only be focused down to an area the size of the image of the sun and not to a point. Because an extended source can not be collimated by a parabolic dish as well as a point source can be, it is difficult to project all the energy collected by a parabolic mirror down a long (20 meters) 4 inch diameter tube. So, solar energy collimated by a parabolic dish and sent down narrow tubes (4 inch diameter) is mostly useful for lighting purposes. Ever have a need for a binocular mount for bird watching, target viewing or star gazing? 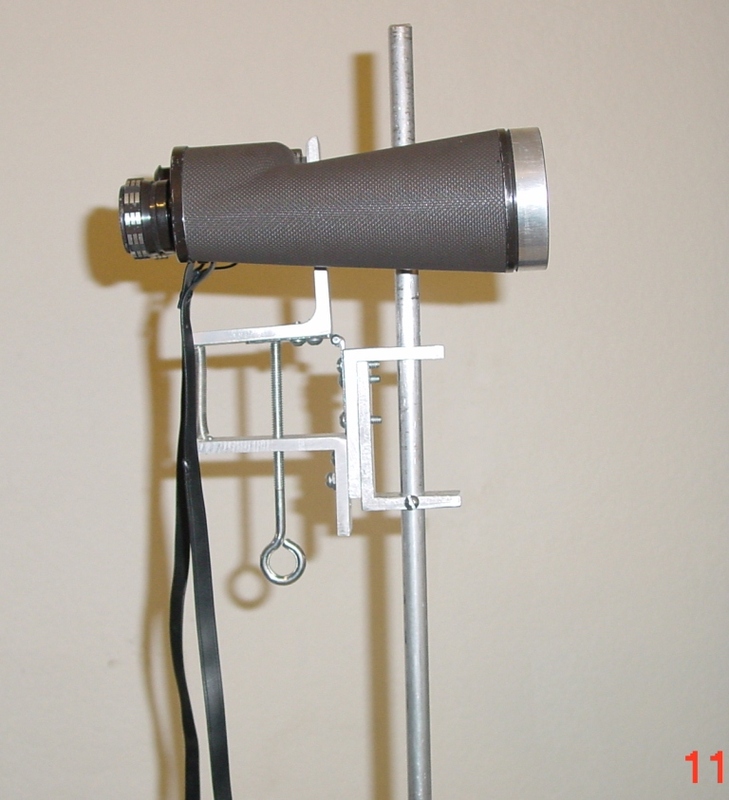 Below are photos of a homemade binocular mount. Mount is vertically adjusted on half inch diameter aluminum rod and angular adjustment is made with 1/4-20 screw.